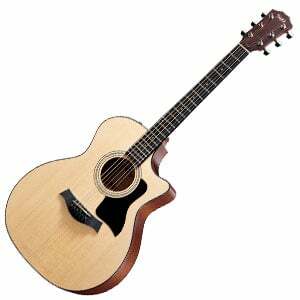 Taylor 314ce Review – A Powerful American Taylor! It seems odd – almost wrong – to refer to an acoustic guitar at just under $2000 as an ‘entry-level model’, but this delightful 314ce electro-acoustic is certainly the first port of call when it comes to Taylor’s true high-end range. Remember, some Taylor models can reach prices in the tens of thousands, so in the grand scheme of things this all-solid wood, American-made model is already looking like great value! Let’s check it out. The 314ce sports the Grand Auditorium body shape, which was an original Bob Taylor design introduced in 1994. It’s certainly stood the test of time, and is both beautiful to look at and a true performer for all styles of play. This model – with a 25.5” scale length – features a sleek Venetian cutaway to allow good access to the highest frets. The woods used to construct the 314ce are all excellent and make for a versatile guitar – there’s a solid Sitka spruce top, with solid sapele back and sides for a good all-round sound. The top is finished in gloss, while the back and sides enjoy a smooth satin finish. Moving up and we find a very playable satin-finished tropical mahogany neck (joining the guitar at the 14th fret) with a width of 1.75”, and a genuine African ebony fretboard, featuring 20 frets and dot inlays. Pretty hard to fault the design and build quality of this beauty! Starting with the electronics, and this 314ce features Taylor’s Expression System 2, with their patented behind-the-saddle pickup, which is great at amplifying the natural sound of the guitar. Controls are pretty standard (volume, bass and treble), with the simplified control panel meaning there is no onboard tuner – a very small gripe. The rest of the guitar also shows off some good hardware. At the headstock, you’ll find six quality nickel tuners, with nickel buttons. At the other end – on the African ebony bridge – there’s a Micarta Wave saddle, paired with a Tusq nut, for consistent tone and performance. Finally the guitar comes with its own Taylor deluxe hardshell case, which is an essential piece of kit for storing and transporting your new pride and joy. The Sitka spruce top helps give this guitar a broad dynamic range, while the high-density sapele contributes to big volume, consistency, and brightness. It sounds bold and resonant, and offers good sustain, but is also great for subtler players – fingerstylists will enjoy this model as much as heavy strummers. As for using for performances, through the Expression System 2 the natural sound of the 314ce rings true – bright and clear, but well-balanced. Controls are easy to use, although not as wide-ranging as some other systems. Still, this keeps things simple, which can be a good thing! The 314ce is a superb all-rounder – a simple, but attractive workhorse of a guitar, with a bright and responsive sound, that would be as comfortable performing live – whether in a coffee house, church, or auditorium – as it would be recording in the studio. It’s not cheap, but, taking into account the price of some Taylors, it’s by no means expensive, and proves good value for an all-American made electro-acoustic model. 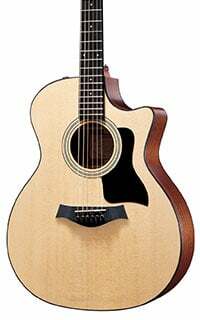 For more info about the Taylor 314ce, click here. Just bought this guitar and splurged over my budget of $1000. Couldn’t rationalize buying a $1000 guitar with laminate back and sides (214 series). Also, the 214 is not Americana. When you put quality strings on it and take it home for your own, you realize the quality of craftsmanship and the impeccable tone. There’s nothing fancy here; just a solid American made guitar that is soft to the touch with a great, clean sound!